Over at F1 Fanatic, Keith Collantine has just quadrupled his workload (impressive enough already) by offering to look through his extensive collection of old motor racing magazines and tell his commenters what happened in F1 on their birthdays. At the time of writing, he has had 121 comments, which should keep him out of mischief this weekend. I did comment but only to point out that I am older than F1 so the answer to the question for me is a big fat zero. But that led to me to ponder on what makes us F1 fans in the first place; what life-changing event was it that decided we should follow the sport ever afterwards? The answer for me was very easy. It was the first motor race I attended - one look and I was hooked. The year was 1962 and I had attained the tender age of 14. I cannot remember how I happened to be there but the memory of that event is still clear in my mind. It was a club race on the old Salisbury Airport circuit in Zimbabwe; I sat on the outside of the most demanding corner, a hairpin at the end of the longest straight, and the cars, mostly old front-engined secondhand F1 and F2 cars, came swooping over the crest of the hill, down to the corner, braking at the last second and then swooping through the bend, engines roaring and drivers sawing away at the wheel as their cars twitched at the very edge of adhesion. One car in particular I remember, an old A Type Connaught with cockpit deeply cut away at the sides so the driver could be seen from the waist up. Out of date it may have been but this was the real thing, the bellowing growl of a 2.5 liter engine (I cannot remember what motor it was - you could throw just about anything into those Connaughts), gorgeous dark green paint job, a driver visibly working away at the limit of his ability. It was inevitable that the sight, sound and smell of F1 should capture my sensibilities and from that moment on I was a devotee. On reflection, I realise that the age of the cars involved in that race gave me an overview of the history of F1 in a nutshell - many of them dated back to the early years of the sport, almost as far back as 1950, its birthdate. 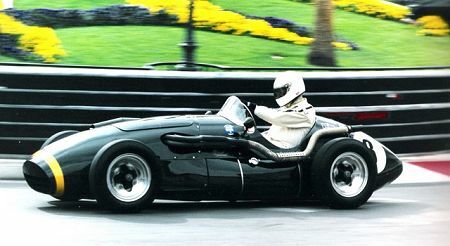 There were a few F2 Coopers involved and the rear-engined revolution was already complete in Europe, but I was allowed a glimpse of the dying years of the front-engined race car, drivers all flying elbows, T-shirts and goggles, the very spirit of open wheel racing in its first half century. How far we have come since those carefree days. So this is the question for my readers to consider: how did you become hooked by F1 and what do you remember of that first experience of it? Note that I avoid the hard work that Keith has taken on - I make no promises of hunting through dusty archives or assembling interesting statistics. But we can enjoy a few moments of delicious nostalgia as we recall that initial experience that impacted upon us so strongly. In the early 2000's I was hooked on the late night coverage of WRC that Speed was offering. I loved watching the cars fly around the corners to the commentary of Nicky Grist, and was frustrated by its absence when the coverage was dropped. Years of frustration lead me to turn on the 2007 Monaco GP. There was something about the interaction of the team mates and the rivalry of the teams that hooked me. One of the Ferrari's crashed out and messed up the qualifying lap of the other, and the commentator thought it was significant. The McLarens were running 1-2 and they couldn't stop gushing about the phenomenal rookie. Something about that race hooked me just enough to watch the next one, but it was the drama that followed that really got me interested. Longstanding team rivalry, industrial espionage, and a talented rookie dicing with his team mate and (to the consternation of said team mate) leading the championship by consistently coming in 2nd. The three way battle for the championship clinched it. I had to watch the next season, and it didn't disappoint. I was in. To my surprise, my wife was equally absorbed. I have been devouring everything F1 since. In the eighties I was aware of F1 and the era of turbos, but I didn't follow it. That was earliest I could have started watching.... knowing what I know now, I wish I had. Oh, what I've missed! Fascinating insight, Marc- you really started with one of the most eventful races of the 2007 season. That was a doozie. I find it very interesting to read how people are converting to F1 nowadays - the TV plays a huge part now whereas in my day there was nothing of that sort. GPs were not televised regularly even in Britain until the late seventies. The fact that it was the drama beyond the races that captured you as well is significant. Old hands like me tend to think of the political background as a bad thing but, in fact, Bernie is right on that score - it adds to the interest and attraction of the sport. There is nothing so good for viewing figures as conflict of any kind! Although I joked in the past that my entry to F1 was via the video game Pole Position, the truth is that I could not follow the sport easily until around 2004 or so, which means my reason for entering is a combination of the availability of information and the poor quality of the dying champcar series and now lame but possibly healing indy series. As a child and teenager I liked the Indianapolis 500 as a specific event and followed other CART events when I could, normally the Australia, Cleveland, and Long Beach races. I had an awareness of when drivers came to and from F1, Emerson Fittipaldi, Mario Andretti, and Nigel Mansel being high on my list of all-time favorites, but lack of coverage and my family's habits of meeting on many Sundays kept me from deliberately watching a race, for example. What makes F1 racing different is twofold; that although rules have been made to cut cost and cripple progress (to equalize the cars) they have deliberately not allowed themselves to succeed at levelling the field. This thankfully gives at least the impression that we are watching a contest between who has created the best invention, not just who is the best at operating it, and that venue standards have remained relatively high. Compared to the final days of ChampCar driving in the bumpy streets of wherever, F1 venues are beautiful and well-sculpted, and though they do not appear to provide a challenge to the greatest drivers in the world, you can see from watching minor forms of racing in the same venues that the tracks are indeed difficult. By comparison, besides having your brain mashed into the right side of your head, the permanent left turns that Americans are accustomed to seem boring and challengeless: the sole challenge is meandering through traffic. I suppose a look at the US highway system explains how so many Americans relate. Ah, that's two who have come to F1 through other forms of racing - although I was far from the center of motor racing, the earliest forms that I watched locally were attempts to duplicate F1 with whatever was available and so we looked to that formula as the epitome of racing. It also shows that, if we're inclined towards racing, we take what we can get - if the TV shows WRC or Indycar, that's what we'll watch. Interesting what you say about deliberately not leveling the playing field, Chunter. Is it an illusion that the best technology and innovations win? I will have to think about that. If I apply your analogy regarding experience of traffic conditions having relevance for racing, however, I think the epitome of European motor racing would be Mini-Cooper races - hordes of tiny vehicles all trying to go through a corner at once! The first Grand Prix I remember watching was the Portuguese Grand Prix of 1985. It's beyond my powers of recall to remember quite what it was that hooked this particular six year old for life. Perhaps it helped that it was a *very* wet race. Why was I watching? Probably my Dad's fault. I think he was determined that at least one of his sons would get the bug (he raced single seaters a bit in the early 70s, from what little he's said about it, ) and it turned out it would be me. Going to Brands Hatch for the European Grand Prix sealed the deal. It's been something of an obsession ever since. By chance my latest guest post on sidepodcast covered my introduction to motor racing. I know Clive has seen this before as it appeared originally on a site he edited. Patrick: There is nothing actually attending a GP for "sealing the deal", I think. The amazing thing is really that the TV experience is still sufficient to hook so many, even though it lacks the sound and smells. I wonder if all fathers are somewhat reticent about their history when speaking to their kids. I asked my father many times what he did in the war and he always answered, "Oh, I sent trucks up and down the Himalayas". Steven: Ah, I remember that now. A poignant tale indeed. Mr Soap: Hah, I like the exception - I, too, could hardly bear to watch in 2004! My earliest memories of F1 were the Adelaide GP's in the late 80's with the actual moment in time that I was first made aware of the brilliance and drama of F1 being the tyre blowout that Mansell experienced in 1986. As a 13 year old I was hoping that he would win and the instant it all changed brings a very clear memory of a very loud and unexpected shouted expletive (much to the shock of the people I was with!). Other notable memories of the time were realising that Alan Jones was a former world champion who was back in F1 (which highlighted recent history in F1 from the perspective of Australian participation which I was previously unaware of) and Senna in the beautiful black & gold Lotus. A shop that I used to go to in Sydney had a piece of a Senna front wing (lost during one of the Adelaide GP races) and a photo of the incident framed together on display. This also somehow highlighted some of the magic of F1. Having said all of that as much as I followed F1 closely (as much as an Australia F1 fan in the 80's & 90's could) it wasn't until I went to the Melbourne GP in 2002 (with Webber getting points in the Minardi) that it became closer to the obsession it is today! I guess my earliest connection with F1 would have been articles in Road & Track magazine and my first F1 race in person was Gilles Villeneuve's first Canadian GP at Mosport.I remember reading of the exploits of Jackie Stewart and co. from around the world, by Postlewaite, Innes Ireland, Rob Walker and many others. Reading and watching black + white clips on TV of the amazing evolution of the Formula 1 cars was an interested as far back as primary school. I think I was hooked on all car racing from the time I was 7, when my father took me to the local speedway. This was about 1960 and the cars were a mixture of old 40s modifieds. Despite the occasional wheel coming off and boiling radiators, I was totally enthralled and have been ever since. Interestingly enough, the local speedway went belly up about 30 years ago....the owner just tried to gouge too much money from all concerned. Sounds familiar, doesn't it? Tapyarg: Ah, Adelaide - now there was a street circuit. And to have witnessed some of the pivotal moments in the sport - no wonder you were hooked. Webber's points in the Minardi must have been the most popular debut for a driver in decades. Let's hope he gets the car he deserves this year. Nick: Familiar indeed - Bernie take heed. Clive: The real show is being there! My first F1 at Mosport was great. The price of admission got us a campsite, free firewood, we could go anywhere on the track we wanted, the pits were open to those who bought the full ticket ($50.00). We watched the Ferrari team changing an engine about midnight. Hamburgers were the same price as anywhere else. Most of the field were running Cosworth Ford engines. We could get within feet of the cars on the inside of corners. The last one was $600.00. I was 100 feet from the track on a rickety temporary bleacher, had to walk miles to get there, hamburgers were $12.00, a beer was $10.00. Nobody much was smiling at the concession stands despite the huge amounts of cash they were pulling in. I'm not sure I'd go back even if an F1 race came back to the USA or Canada. If they're on TV I'll watch and root for Williams because they have been done the most with the least! Nick: You are so right about being there. Back in the sixties I could wander through the pits, looking at the cars and engines, listening to the drivers and mechanics talking, and then select my spot on a circuit that was without barriers of any kind. Most of my photos of the period were taken standing just two or three feet from the edge of the track - I was young and never thought of the danger but did at least choose the inside of the corner! Things are so different now - a grandstand seat will be a long way from the track and detail of the cars impossible to see. The sound is still there but the smell has gone with the wind. Even so, a modern GP is still such an impact on the senses that it creates either love or hate in the beholder. My Dad was a mechanic, when I was small. He knew the owner of the local AP muffler shop. He traded the guy something for a promotional model of the '58 Indy winner, a very famous laydown or sidewinder roadster and gave it to me. I was entranced!! A car built just to race, and so beautiful. Then one Sunday afternoon in '62 or '63 I was sick in bed watching TV when a broadcast of the Belgian GP came on. Networks in those days were looking for anything to fill up Sundays. I was absolutely fascinated by these tiny little cars whizzing through the forest at 190 right on the highway! And the fastest and most beautiful was a green and yellow car called a Lotus, driven by a Scotsman named Clark. I was hooked. Am still a huge Clark fan, sorely miss Lotus, and love all forms of pavement racing. Dirt is OK but if God had intended for us to race on dirt, he would not have invented asphalt. Didn't get to see my first live race until '79 ('78?) at Watkins Glen, but got to be a Hot Grid marshall for every race at Long Beach and Vegas with CREDENTIALS, Yippee. I could have low-fived any driver who stuck his hand out at some spots on the tracks, and you could smell who was using nitro for a little extra power. Those were indeed the days. I inherited my love of motorsport from my dad, who was a regular at touring car races and followed the Tasman series, and Piers Courage in particular, when it touched down in Australia in the late 60's. And we spent a lot of time as children eating dust in the forests around Canberra when the Southern Cross Rally came to town. Like Tapyarg, my first major exposure to Formula 1 came as an 11 year old with the Adelaide GP in '85 - the first in Australia. I remember dad telling me about a hotshoe called Senna in the JPS Lotus who was fantastically quick in qualifying, but whose composite brakes were fragile. And in '86 willing Keke Rosberg to win his final race, and then marvelling at Mansell's car control as he wrestled his stricken, sparking Williams after his tyre blew out. Those November weekends were filled with nothing but Formula 1, as we got (and still get) blanket coverage of the Australian GP, and it was in this forge that my love of F1 was formed. Lonny: What an introduction to F1 - Spa in the sixties. No wonder you were caught from that moment! Interesting that the races that seem to hook most people are either the classic circuits or street circuits that allow the surroundings to give the cars scale. I can't imagine anyone becoming addicted after watching a race at Barcelona or Bahrain. Long Beach was a wonderful track. To be a marshal there was an honor indeed. Timbo: Ah, a childhood steeped in motor sport - I envy you. My father wasn't interested in the slightest and I cannot even remember what chance it was that led me to attend my first race. The Tasman series was as good as F1 and most of the star drivers had a go at it, so I reckon you were there from the very early days! Lee: That's a good point about the competitiveness of drivers. To see hard-fought battles between really skillful drivers is so much more likely to capture new fans than entry at a time of dominance by one driver or team. That is one reason why I'm enjoying our present period - there might have been little overtaking in the last few years but there is not much to choose between the top drivers and we've had some fantastic races as a result. It looks like continuing into next year as well. However, I wasn't bitten by the bug until a year later when I was living in Edinburgh. We didn't have a TV in my flat, so TV had become a bit of a novelty. I was visiting a friend down in York for the weekend. The teev was on in the background, and having been deprived for so long, naturally my eyes kept wandering over to it. A race was about to start, and I had no clue where, who was driving - anything. But the start of that race ensured I have been hooked ever since - it was Spa 1998. Who could witness that, and not become intruiged? I found out from my friends that there was a Scot driving - one David Coulthard who immediately became my favourite (once the re-start happened), and later events of the race ensured that a certain German driver would become my arch-nemisis. In all, I've been hooked ever since. Who knows where the Stig comes from, Peril? He could be an alien and been around for hundreds of years! Television grabs another viewer for F1. It has been enormously influential in spreading the word, I must admit. That Spa start was very chaotic - it took out nearly half the field. Just as well they had spare cars in those days. if i recall correctly, in the late 60's and early '70's the monaco gp highlights were shown on wide world of sports the weekends after the actual event. all my neighborhood playmates were boys soooo... jackie stewart was our idol. well, mine anyway. and we kept up with the rest via the sports pages. several years later i was relocated to seneca falls ny--at the other end of the lake from watkins glen. i went to my first f1 race in 1976 or '77 when i was 15 or 16. i was so hooked i didn't even mind slogging around in the rain. it was sort of the mode du jour up there anyway. sorry, i'm just catching up on the blogs. so, clive grew up in africa? that must have been a great childhood! Monaco does seem to catch a lot of fans - or it did in those days. Funny that the circuit that always gets televised is the one the experts say can't be raced upon! My childhood was just as ordinary as anyone else's, Vera; when it happens to you, it's just normal. A great man did teach me a few years ago that there is mileage in recalling memories, however, and I wrote several posts on Africa in my personal blog, Gone Away. The African posts are linked - start with Okay, I Admit I Had a Childhood.